Great you've found this Web site but please note that it's a "bit" outdated ;) but you may want to see blog.timmerer.com for more recent information! This Web site is a bit out of date and you may check my blog for more recent news which includes also latest publications. Co-Chair, 3rd European Workshop on Mobile Media Delivery (EUMOB) 2009, co-located with the 5th International Mobile Multimedia Communications Conference, London, UK, September 7-9, 2009. Co-Chair, Int'l Symposium on Multimedia over Wireless, co-located with the 5th International Wireless Communications and Mobile Computing Conference, Leipzig, Germany, June 21-24, 2009. Member of the Editorial Board of the Encyclopedia of Multimedia, 2nd edition, Springer, October 2008. In priniciple all types of projects (practical courses, thesis, etc.) in the field of multimedia communication are possible. If you have further questions do not hestitate to contact me directly. Ingo Kofler, Christian Timmerer, Hermann Hellwagner, and Toufik Ahmed, Towards MPEG-21-based Cross-layer Multimedia Content Adaptation, Proceedings of the 2nd International Workshop on Semantic Media Adaptation and Personalization (SMAP 2007), London, United Kingdom, December 17-18, 2007. [Abstract] [SMAP2007] [PDF]. Co-Editor, International Standard, Information technology — Media context and control — Part 7: Conformance and reference software, ISO/IEC 23005-7, Committee Draft (CD), January 2010. Co-Editor, International Standard, Information technology — Media context and control — Part 3: Sensory Information, ISO/IEC 23005-3, Final Committee Draft (FCD), October 2009. 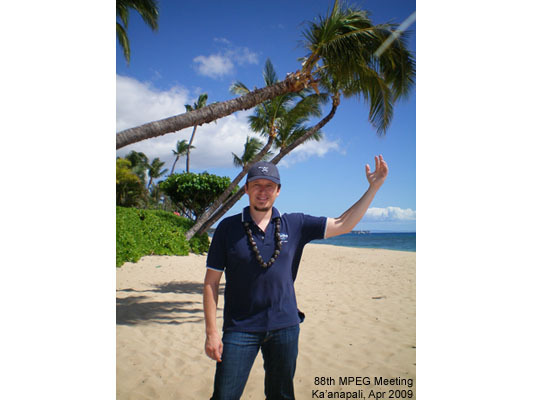 Co-Editor, International Standard, Information technology — MPEG extensible middleware (MXM) — Part 4: MXM protocols, ISO/IEC 23006-4, Study of Final Committee Draft (SoFCD), October 2009. Co-Editor, International Standard, Information technology — MPEG extensible middleware (MXM) — Part 3: MXM conformance and reference software, ISO/IEC 23006-3, Study of Final Committee Draft (SoFCD), October 2009. Co-Editor, International Standard, Information technology — MPEG extensible middleware (MXM) — Part 2: MXM API, ISO/IEC 23006-2, Study of Final Committee Draft (SoFCD), October 2009. Co-Editor, International Standard, Information technology — MPEG extensible middleware (MXM) — Part 1: MXM architecture and technologies, ISO/IEC 23006-1, Study of Final Committee Draft (SoFCD), October 2009. E2EQoS4UMA Workshop on End-to-End Quality of Service for Universal Multimedia Access, at AXMEDIS2006, Leeds, UK, December 2006. D·A·CH Security 2006, Düsseldorf, Germany, March 2006. IEEE-MIPR 2005, First IEEE International Workshop on Multimedia Information Processing and Retrieval, Irvine, California, USA, December 2005. AXMEDIS 2005, 1st International Conference on Automated Production of Cross Media Content for Multi-channel Distribution, Florence, Italy, November 30 December 2, 2005. SPIE Optics East 2005, MULTIMEDIA SYSTEMS AND APPLICATIONS VIII (IT106), Boston, Massachusetts, USA, October 23-26, 2005. CBMI2005 - Fourth International Workshop on Content-Based Multimedia Indexing, June 21-23, 2005 Riga, Latvia. 47th International Symposium ELMAR-2005 focused on Multimedia Systems and Applications, 8-10 June 2005, Zadar, Croatia. WIAMIS 2005 - 6th International Workshop on Image Analysis for Multimedia Interactive Services, April 13-15, 2005, Montreux, Switzerland. ICVIP 2005 - International Conference on Video and Image Processing (ICVIP), April 11-12, 2005, Montreux, Switzerland. Mobile Computing und Medienkommunikation im Internet 2004 (MCMI'04), Ulm, September 23, 2004.